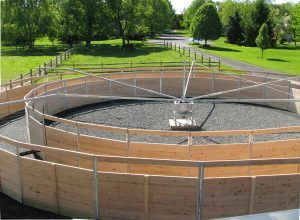 We make our Derby model in 60′, 65′ foot and 72′ diameters. 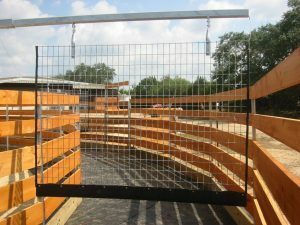 We build the machines for 4, 5 and 6 horse arrangements. The Derby is ideal for walk, trot and canter workouts. We build our exercise horse walker with tension cabling and hinge point arms. The design keeps weight away from the exercising horses. 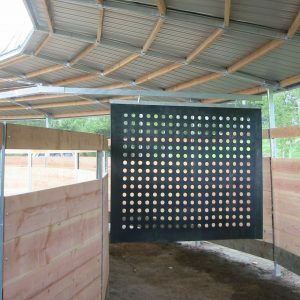 The pliant tensile structure enhances horse safety. 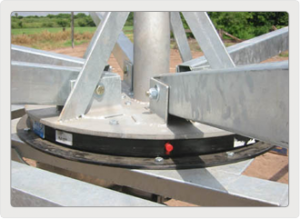 The design also reduces rotating weight which means less power to operate and less less wear on the motor drive. We back our EuroXciser with a 10 year warranty on the motor drive train and frame. 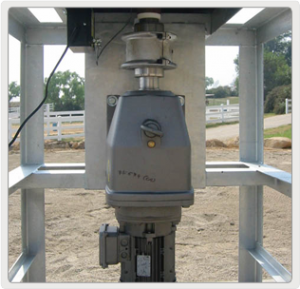 We use direct drive geared motors manufactured by Nord in the USA. The motors are low maintenance and designed for high duty service. The gearing provides whisper quiet operation. Overall, the design provides unparalleled performance and reliability compared to belt and chain drive designs. Height at center under 11’.